BEFORE YOU BEGIN - PLEASE NOTE! With proper setup and care, your Phantom bindings will operate seamlessly in the mountains. But as with any new system, we recommend taking the time to understand how it works to avoid frustration at a time when you should otherwise be fully focused on your line. We recommend going on conservative tours the first few times out to make sure the system is properly set up. If things are going to loosen up, it usually happens soon after setup. When tightening and loosening screws, be careful to prevent cross-threading, and always use a non-permanent locking compound (ie blue Loctite, not red - included in the tool kit) on the threads of all screws that mount to the board. This will reduce the potential for unwanted loosening while touring/riding. Finally, Phantom bindings are engineered for a very tight tolerance fit. Be aware of ice/snow build up on your top sheet and your inside edges, and always carry the Phantom scraper (included in the tool kit) with you in your jacket pocket. Before putting your board together, cleaning your board of ice and snow will help ensure everything goes together as easily as it did when you first set it up at home. CHECK THE FIT OF THE BINDINGS ON YOUR BOOTS. We have tried to build your bindings so they are a perfect fit out of the box, using the boot and size information you provided with your order. The image above is how the binding should look when properly fitted for your boot. To "strap in," simply kick the heel of your boot back so that the all-metal bail catches securely on top of the heel lug of your boot, then bring the toe bail up and over the front of the boot, and press down to secure the lever on the toe welt. It is your responsibility to ensure the fit is secure and the bails won't prematurely release. There are 2 adjustments that can be done depending on how much play you're experiencing in the bails. Figure 1 is a bottom view of the binding assembly. These screws can be loosened and the corresponding bail block adjusted from the outer to inner or inner to outer positions on the binding plate. The difference between these positions is 5mm. Figure 2 is a side view of the binding assembly. By removing the same screws as in FIGURE 1 you can also adjust the position of the bails themselves. The bails can be moved from the outer to inner or inner to outer positions in the bail blocks. The difference between these positions is 10mm. FIGURE 1. Countersunk holes provide fine (5mm) adjustment options. FIGURE 2. Slots in bail blocks provide coarse (10mm) adjustment options. Fine and coarse adjustments can be done simultaneously. The tightest position is achieved by moving both the bails and the bail blocks inward. The widest position is achieved by moving both the bails and the bail blocks outward. Figures 3-6 show the various positions for a progressive 5mm adjustment, and provide an overview of which boot sizes will fit on which size binding plates with BOTH toe and heel bail blocks/bails set in this position. FIGURE 3. The smallest/tightest bail position (bail block and bail are both set to the inner position). Size S: BSL 257/Mondo 23. Size M: BSL 277/Mondo 25. Size L: BSL 297/Mondo 27. Size XL: BSL 307/Mondo 28. FIGURE 4. 5mm wider than FIGURE 3 (bail block is set to the outer position, bail is set to the inner position). Size S: BSL 267/Mondo 24. Size M: BSL 287/Mondo 26. Size L: BSL 307/Mondo 28. Size XL: BSL 317/Mondo 29. FIGURE 5. 10mm wider than FIGURE 3 (bail block is set to the inner position, bail is set to the outer position). Size S: BSL 277/Mondo 25. Size M: BSL 297/Mondo 27. Size L: BSL 317/Mondo 29. Size XL: BSL 327/Mondo 30. FIGURE 6. 15mm wider than FIGURE 3 and the widest position (bail block and bail are both set to the outer position). Size S: BSL 287/Mondo 26. Size M: BSL 307/Mondo 28. Size L: BSL 327Mondo 30. Size XL: BSL 337/Mondo 31. It is possible to "false lock" the heel bail. Always make sure the heel bail is secured correctly - on top of the heel lug - as in FIGURE 7. It is normal for the toe lever to sit up off the top part of the boot a little bit, especially with the Arc'teryx Proclines. You just want to make sure the lever snaps into place, feels secure and your toe doesn't move around inside the toe bail too much (a very small amount of side to side play is normal). The screw on the underside of the toe lever can be adjusted to tweak the actual seating tolerance of the lever on the toe welt. With the Proclines, which have a smaller than normal toe welt, you will need to use the longer nylon screws included in the tool kit (note that these screws will need to be cut to the appropriate length from the full length provided). This will ensure that the lever seats itself securely right where the toe welt meets the boot as in FIGURE 8. See here for more info if riding Proclines. It's typically the heel bail position that will determine if the boot is centered on the binding and therefore over the board. 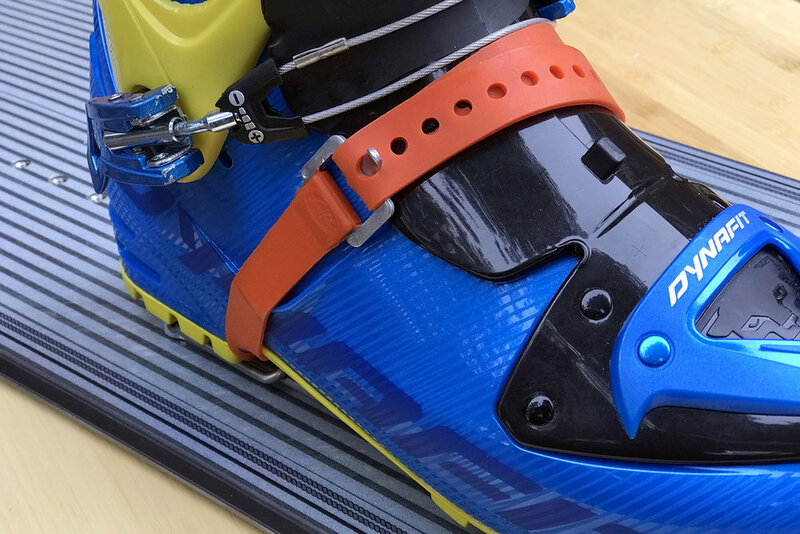 Once the bindings are mounted on the board, always check to make sure your boot is centered to prevent unwanted toe/heel drag. FIGURE 7. Properly secured heel bail. FIGURE 8. Properly secured toe bail/3.5 degree inward canting. FIGURE 8 also shows the canting that comes with all Phantom bindings. Each binding is canted at 3.5 degrees inward. This is one way to tell which is your front foot binding and which is your back foot binding. The bindings aren't marked front/back out of the box, but you may choose to mark them for quick reference. Two different sizes of screws are used to secure each bail block. The longer 2 screws are used on the side where the cant (angled plastic piece) is thicker. The shorter 2 screws are used on the side where the cant in thinner. Never over tighten! The stainless heads can strip out if too much torque is applied. As long as the bail blocks are flat against the cants and the cants are flat against the binding plates, the screws are snug enough. The cants actually impart a slight load on the screws that helps lock them in place. When tightening, start with one and just barely get it threaded. Then do the second, the third and the fourth in the same way. Now you can start tightening them down, each a little bit at a time to help minimize the chance of cross-threading. While tightening, it's a good idea to keep checking that the bail is seated properly in the bail block. Note that it may be necessary to squeeze the bail while the screws are being tightened so as not to pinch the bail lip/stop in between the block and the cant/binding plate. A little bit of anti-seize may be applied to these screws to make the process easier and is recommended for bindings that will be adjusted several times such as those used for rentals or demos. MOUNT THE CLEATS AND SET YOUR ANGLES. We send the cleats assembled so you can see how all of the parts fit together and which screws go where. You will need to disassemble before you get started. This is how you set your stance width and setback. Make sure that the two halves of the splitboard are perfectly aligned with all hooks engaged and the tip and tail clips latched. Our Hercules Hooks and Voile hooks lock together and usually ensure the two board halves are in perfect alignment. Karakoram clips allow for slight variations in board half positions and will require more careful alignment. Position the cleat plates on your board in pairs, nested together as shown in FIGURE 9. Move forward/backward and together/apart to set your preferred stance, then tighten each plate with 2 shorter screws (with Loctite!) directly into the factory inserts in your board. When tightening the screws, hold the plates together and slowly tighten a little bit at a time, making sure the plates don't move and twist out of contact/alignment. As an additional step to prevent the plates from shifting, we recommended that you tighten the screws, leave them overnight, then tighten down once again. FIGURE 9. Properly nested cleat plates. FIGURE 10. Bindings should rotate on freely. Once all cleat plate screws are tightened, rotate the bindings onto the plates as shown in FIGURE 10 checking that they rotate freely. There should be a little bit of room between the plates and the binding. If there is interference, loosen the screws and readjust as necessary, making sure that the plates are properly nested together and do not shift when tightening the screws. 3. SET YOUR ANGLES BY MOUNTING THE CLEATS THEMSELVES. The cleats can be set from 0 to +/-30 degrees (+/-30 is the max). Make your coarse angle adjustments using the various threaded holes in the cleat plates. The 7 threaded holes offer 3 positive degree positions and 3 negative degree positions. Each position provides an increment of +/-15 degrees as illustrated in FIGURES 11-13. Once you know which screw positions to use for your desired angles, assemble the cleats as shown in FIGURE 14. The plastic side of the cleat faces down and the metal side with the countersink slot faces up. The washer sits on top with the "P" facing up and the 2 longer screws tie everything together. The washer is notched in 5 degree increments (the middle notch representing neutral or 0 degrees), and is how you will set your final angle. Set one side (ie one cleat) to the correct angle but leave the opposing cleat a little bit loose for now. You will tighten everything again later, and this will help ensure the opposing cleats are in the perfect position to accept the binding pins. For reference, the set of cleats in FIGURE 14 is set to +17 degrees (the screws are in the +15 degree position and the washer is set to an additional +2 degrees). FIGURE 11. Use these threaded holes for angles between 0 and +/-10 degrees. FIGURE 12. Use these threaded holes for angles between +10 and +20 degrees. For -10 to -20, use these same holes to the left of the center position. FIGURE 13. Use these threaded holes for angles between +20 and +30 degrees. For -20 to -30, use the same holes to the left of the center position. FIGURE 14. Final assembly set to +17 degrees (the screws are in the +15 position, and the washer is set to an additional +2 degrees). As always, use non-permanent blue Loctite (included in the tool kit) on the screws to prevent unwanted loosening! Phantom bindings rotate into position on the cleats and then lock into position. These pins need to be adjusted to ensure the most secure connection to the board. Flip open the Quick Flicks lever assembly on each of the binding bail blocks. This will pull the pin into its "disengage" position. In this position, use the hex head bit included with the tool kit to loosen the jam nut on the threaded end of each pin as in FIGURE 15. The very end of the pin has a slot machined into it, which accepts the mini flathead bit included in the tool kit. Retract the pin by rotating in a clockwise direction. Send the pin further in by rotating in a counter clockwise direction. Check that you can freely rotate your bindings onto the cleats as in FIGURE 16. FIGURE 15. Quick Flicks lever in the open position. FIGURE 16. Bindings should rotate on freely. With your bindings rotated into position, adjust the pins so when the levers are closed, the pins are perfectly secure in the V-slots of the cleats. FIGURE 17 shows the binding in the locked position with both levers closed. FIGURE 17. Binding in the locked position with both levers closed. Start with the the cleat that you fully tightened at the correct angle. Adjust the pin so it closes tightly but smoothly, leave that side engaged, then adjust the other side. At that point you can go ahead and fully tighten/re-tighten all cleat screws. 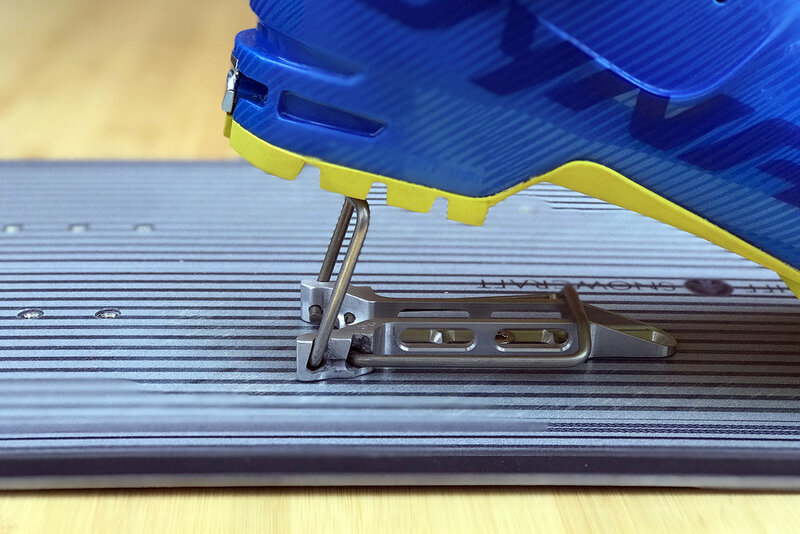 Once both cleats are firmly tightened in place, perform a final adjustment of the locking pins making sure that both levers open and close smoothly and the binding plate sits flat on the board top sheet. We recommend that you "cycle" the bindings a few times - taking them on and off, and making sure everything works smoothly. Always open the lever and loosen the locking nut before adjusting the pin! This will prevent damage to the lever and binding of the pin/lever mechanism. If you remove the jam nut entirely, you will also be able to unthread the pin from the lever mechanism. You'll really only ever need to do this if you need to perform maintenance on the pin. Sticky pin problems can often be remedied by taking the pins out and lightly polishing them with even just a little bit of olive oil. Just pay extra special attention to how the lever mechanism is assembled as you will need to put it back together in the exact same way! After the pins are adjusted, be sure to re-tighten the jam nuts against the lever axles. This will ensure that the pins don't further adjust with use. A little bit of play is preferred at this stage rather than a super tight fit. A little bit of play indoors typically means a properly tight fit outdoors. As you will likely perform this setup in a warm environment, it is recommended that you double check the tightness of the cleat screws the first few times out. This is because temperature differences can actually cause the system to change dimensions just enough to cause the cleats to shift. The Dynafit Speed Superlite toe pieces come riveted to our custom adapter plates. 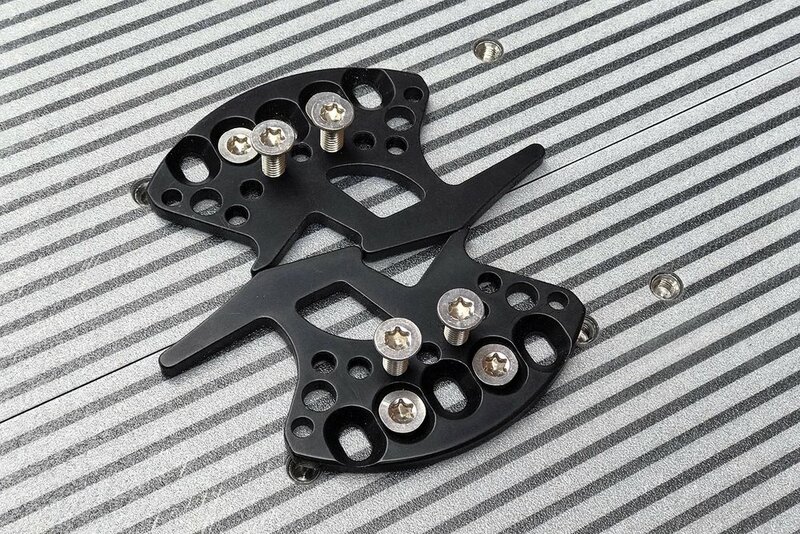 These single unit toe pieces mount directly to the factory touring bracket inserts in your board, and are easy to switch from board to board if you have multiple splits in your quiver. Insert the forward-most, single screw and tighten down just enough so that the adapter will slide on (you want the screw tight enough that it requires some force to slide it on). Put the toe in the open position and slide on. The countersunk slot on the adapter, as seen in FIGURE 18, is what the screw will slide into. Finally, line up the other two countersunk holes with the corresponding inserts and secure with the other 2 screws as in FIGURE 19. FIGURE 18. Single screw in position with toes open and ready to slide on. FIGURE 19. Properly mounted toe. Phantom Rocket Risers mount directly to the factory heel riser inserts in your board. With your boot locked in to the toe, lower the heel to determine correct riser positioning. When in the upright position, you want the climbing wires to land somewhere in the middle of the heel as in FIGURE 20. Some boots have a tread pattern where, if the risers are positioned either a little too far forward or a little too far back, the climbing wires may actually get stuck in the tread "voids." Try to make sure both wires land on a solid part of the sole. FIGURE 20. Climbing wires should land in the middle of the heel. FIGURE 21. Soft lockdown option. The rails on our Rocket Risers are slotted to allow for a "soft lockdown" using a 20-inch ski strap as illustrated in FIGURE 21. This feature is really intended for sidehilling only, not for downhill skiing as it is not rated to release and may lead to knee or other injuries.